If you’re wondering where in the world Carmen Sandiego is this week, or what in the world she’s up to, look no further than Moscow, capital city of Russia. As is generally the case, Sandiego is busy using one of her goons from the criminal organization V.I.L.E. to abscond with with a precious landmark. 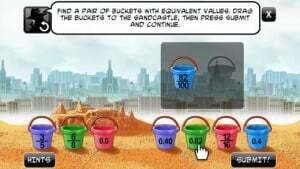 This time, St. Basil’s Cathedral has been turned to sand, and it’s up to you to put your best detective skills to the test and solve the mystery to figure out which V.I.L.E. 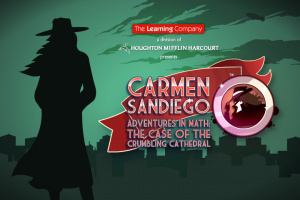 villain could have gotten away with such a heinous crime in Carmen Sandiego Adventures in Math: The Case of the Crumbling Cathedral. 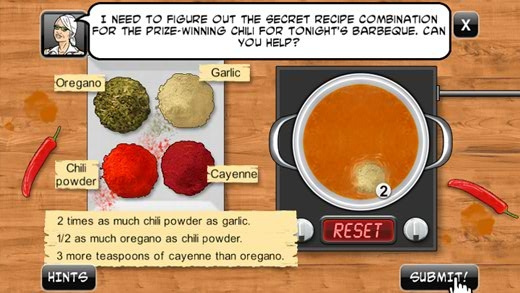 As is the case with the previous two games in this light-hearted edutainment series, the adventure consists of point-and-click style gameplay interspersed with puzzles, much like the popular Professor Layton series of Nintendo DS games. Because this game is meant to be educational and teach young players basic math skills, all of the puzzles that you run into require you to complete some form of basic math problem. Some of the puzzles are based around adding and subtracting fractions and decimals, while others focus more on simple geometry problems. Even at it’s most challenging, however, the puzzles in The Case of the Crumbling Cathedral remain relatively tame in their difficulty. 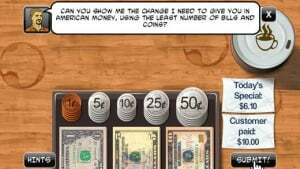 Not only are the puzzles simple and easy to answer, but there are also only ten of them in the entire game, making for a relatively short experience. You’re once again able to transfer your character data over from the previous games, which can be pretty helpful if you’re in desperate need of the hint coins that you may have collected in the earlier installments. 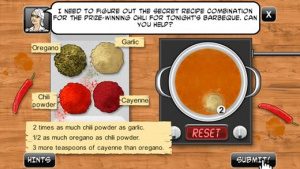 Another feature from the earlier games that has returned here is the multiplayer functionality. Multiplayer gameplay allows you and up to five friends compete against each other in the different puzzles that appear throughout the main adventure. If this doesn’t sounds very exciting to you that’s because it really isn’t very fun at all. Once you’ve played the puzzles once the fun is pretty much gone and you’re just stuck with a very underwhelming multiplayer snooze fest. Because The Case of the Crumbling Cathedral is part of a series of episodic games, it’s no wonder that the audio and visual presentation is exactly the same as it was in the previous two games. The animated looking characters pop out form the detailed backgrounds and environments that they populate, creating a rather appealing visual style. The soundtrack fits the light-hearted tone of the game, though it is still quite lacking in diversity. Just like the two games before it, The Case of the Crumbling Cathedral can be completed in about an hour. Also, the mystery that you have to solve, as well as the puzzles that you play along the way, remain exactly the same each time you play through, so there’s not much in replayability here either. The lack of replayability and incredibly short play times for each of these Carmen Sandiego games is a real disappointment, and makes the purchase a questionable one for any gamer, even fans of the classic franchise. Without having played the previous two games in this ongoing series, you probably won’t be too interested in getting this one either. While it retains all of the charm of the first two episodes, it does nothing more to improve on the formula or stand out as a worthwhile investment. At 600 Nintendo Points, the asking price isn’t too outrageous, but the lack of depth and replayability is a glaring issue for anyone looking for a game with any sort of lasting appeal. Carmen Sandiego Adventures in Math: The Case of the Crumbling Cathedral is more of the same, and at this point you should know that it’s not much to behold. I miss the good Carmen Sandiego games. And the CYOA books. And the game show. I forgot that this chapter was released, I'll be downloading it later. From Word Searcher to House MD to Carmen Sandiego... you're a saint, Ron! In Soviet Russia, Gamelion Studios Soviet RUSHs you!